People generally refer double quotation mark shortly as quotation mark while single quote is referred as apostrophe. On a standard English keyboard, double and single quotes appears on a same key. You need to press shift to type double quotes. However, most of the documents will convert neutral quote into a curly smart quote format. Hence, ensure to have appropriate settings in the documents to retain the straight quotes. The quotation mark may looks like curly on the browser, however neutral or straight quotation mark will look like straight on documents. There are many different types of quotation marks in Unicode general punctuation block. Here are the keyboard shortcuts for Mac and Windows all types of quotes. On Mac, ensure to use Unicode Hex Input and on Windows use number pad for typing numbers. Use alt key with 0034 to type neutral quotation mark in Word and other Windows based documents. Alternatively, use can use 0022 and alt X keys to type neutral quote only on Word documents. 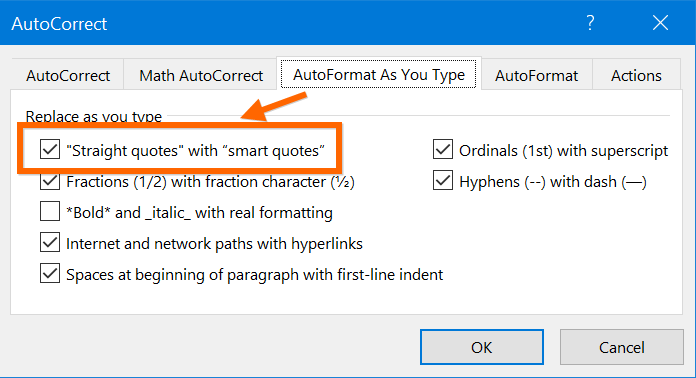 Whenever you type the neutral quotation mark, Word will automatically convert it into a smart quote in curly format. However, you can follow the below instructions to stop this auto correction. Launch Word and open any document. Go to “Files > Options” menu. Click on “AutoCorrect options…” button under “Proofing” section. Go to “AutoFormat As you Type” tab. Look under the heading “Replace as you type”. On Mac, first change the input type to Unicode Hex Input and then use option key with 0022 to type neutral code. You can change the input method back to ABC from the option on the top menu bar. Alternatively, launch Character Viewer by pressing control + command + space and search for the quotation mark under punctuation tab. Similar to Microsoft Word, Pages app on Mac also will convert the neutral quote to smart quote. Follow the instructions in this article to disable this option in Pages app. You can use the entity name & quot ; directly to insert the symbol. Otherwise, use decimal or hexadecimal codes. Unlike curly quotes, neutral double quote has single representation for opening and closing mark. Straight double quote is used in many programming language to accommodate the value of the variable like A = “test”. Related: Learn more on disabling curly quotes in WordPress.